In a world where social media allows us to connect with almost everyone in the free world instantaneously, one platform dominates the professional networking space. Its name? LinkedIn. By now, most people in the professional world have heard of LinkedIn. Job seekers know it can help them find a career, but many don’t know how to maximize their use of the platform. This hurts their chances of standing out to the almost 50 percent of companies that solely use it in their social recruiting practices. When employers look for potential candidates on LinkedIn, there are a multitude of ways they narrow down the pool. Check out these three tips to help you get the most out of your LinkedIn profile, increase your chances of getting noticed by recruiters, and become a better proactive job seeker. LinkedIn not only connects people in order to build their network, but also it allows you to find and apply for jobs directly through the site! Just like any other job board, you can search for the exact job you want and discover employers from around the world. The benefit for job searching through LinkedIn: it allows employers and job seekers near-instant access to connect and gather information about each other, and gives candidates more insight into the company and its employees. If you make a list of companies you want to work for (which you should, if you haven’t), LinkedIn lets you follow the company pages of those that have one. On those pages, companies often exclusively post jobs, since they know it will reach people who have already vested interest in their organization by following them in the first place. This gives you access to positions you never would have known existed and also lets you engage/connect with employees in those organizations. When you apply for a job on LinkedIn, it’s important to read the entire job posting. Doing so lets you get a feel for what exactly they’re seeking so you can tailor your application specifically to the posting. Since the LinkedIn application system only lets you attach a resume when applying, many companies give specific instructions for how they want candidates to apply in order to get more information. By not doing so, you’re probably not going to get considered for the job, since they now know you just blindly applied without following the application instructions. Also, don’t just apply to every job posting because it’s so easy — chances are, it won’t get noticed. Remember when networking was something you did with your dad or mom and their circle? Your parents would mention to their friends, "Did you know my daughter is interested in advertising?" Nowadays you don't need a parental circle, or even your parents, to connect to people who can help with your career. You do need a plan. Now that you can contact people so easily on LinkedIn, how will you use that access? LinkedIn adds texture to a boring résumé. It brings your interests, charities, and portfolio to life in one place. But it's also easy to overindulge—like a college freshman at his or her first kegger—and embarrass yourself. Making a silly mistake on Facebook is one thing. Embarrassing yourself on LinkedIn could cost you a job or career. Mistake No. 1: You don't consider yourself a product. Deconstruct what you like about your favorite brands. Are they funny, clever, consistent? Do they always deliver on their identities? Do they innovate? Do they have a competitive advantage? Keeping those considerations in mind will help you build a simple, tailored, smart profile. Once you determine your personal product voice, incorporate it into your profile. Lead with a concise, well-written summary that details your capabilities and what you can contribute. Mistake No. 3: You're too social. Stop thinking of LinkedIn as a social network. It's a professional network. There's a big difference in how you approach a social dinner versus a business dinner, right? Use this analogy. Rather than focus on connecting with buddies, zero in on connecting with people you just met at a conference. You may not be as "social" with them as with your college buddies, but you do have a common business interest that will serve you much better on this platform. Your headshot should also be professional. A suggestive shot or one that shows you partying won't go over well in human resources. Job searching on LinkedIn offers the job seeker multiple benefits. Most importantly, internal and external recruiters use it to source talent. It is also helps you network – connecting with contacts who may help with identifying job opportunities, referrals, and offer advice and information. Take care to manage your Linkedin profile properly. Mistakes can hurt your job search and your professional image. Consider these tips on what you shouldn’t do on LinkedIn. 1. Don’t leave your sub-headline to read your job title. By default, your current job title is the default sub-headline (the text that appears under your name) for your profile. It typically reads something like Accountant at 123 Company. That doesn’t tell the employer much upfront. The sub-headline is one of several important areas that drive keyword density, so entice potential employers and recruiters to click on your profile by putting in a personal branding statement like Tax Compliance Specialist & Strategic Business Consultant for Fortune 500 Companies. 4. Don’t accept every connection that comes your way. The bigger the network, the better it looks, right? Not exactly when you’re a job seeker. Yes, it’s good to have a big network of connections, but it also has to be appropriate connections. You want to show potential employers and recruiters that you have connections in the field and industry. For instance, if you are vying for a job in health care business development but your profile shows 90% of your connections are made up of contacts in random fields and industries, it’s not exactly informing employers and recruiters that you’re well-connected for the job. 3) Commit to network, NOT sell. LinkedIn is a tool designed for networking, it isn’t designed for selling. Many people connect with those they don’t know and then immediatly send them sales messages. Bad move. I hit delete and remove them as a connection. Focus on building relationships. Look at their profile to find things you have in common and mention those in your message to them in order to build the relationship. 7) Commit to spend at least 15mins on LinkedIn a day. For my business LinkedIn is one of my most powerful lead generation tools. Fifteen minutes a day goes a long way! Just what can you do in 15mins? Click like, comment or share: I look through the activity feed and see what others are up to and click like or comment. If they posted something my followers would like, I share it. Check messages and invites: Of course I respond to any messages and look to see who has invited me to connect. If I don’t know the person I read their profile, check their website and then send them a message. I only connect to people I am willing to develop a business relationship with. Send a note: I find people I haven’t connected with in a while and send them quick note or a link to an article or event I think they will find interesting. I don’t do all of these things every time, but throughout the week I will do all of them. I login to LinkedIn at least once a day for 15 minutes but I schedule time on my calendar to use it as a lead generation tool at least once week for about an hour at a time. 8) Commit to help others. If you really want to be a powerful LinkedIn user, find ways to help others. Connect people you know who should be connected and let them know why. Invite people to groups they would be interested in. Share valuable information you have read that will interest them. Help them learn to use LinkedIn by sharing this article with them (shameless self promotion). LinkedIn recommendations are a tremendous asset to your job search. You can quickly and easily point a potential employer to your LinkedIn profile and they’ll be able to see verifiable references and recommendations of the quality of your work and the results you deliver. Positive words can be powerful motivators. So, how do you choose the right people to request a recommendation from? And how do you know if they’ll give you a good recommendation? Are you an active member of a nonprofit or involved in volunteering for a great cause? Ask someone who oversees the organization to recommend you for the work you’ve been doing. Not only is this more positive PR for your profile, but it shows your interests and desire to help others. Have some additional ideas for great LinkedIn recommendation requests? Share them here; I’d love to hear them! And while LinkedIn is on your mind I’d love to connect so feel free to send me an invitation here. Having a LinkedIn profile is a good start to connecting with recruiters and hiring managers, but you must do more than just create an account and list a few jobs in your profile. A few of my previous articles highlight some of the key tasks to getting noticed on LinkedIn: How to Be LinkedIn to Recruiters and How to Add Recruiters to Your LinkedIn Network. Included in these articles are mentions on being part of Groups. Beyond what is suggested in those articles, I’d like to share some more ideas on Group participation. Although this should be obvious, Group leaders are looking for relevant posts to attract and keep Group members. They will block you if you continually just submit generic links, mundane information that has little to do with the intent of the Group, and worse yet, promotions of your services (there is a separate section for this called Promotions). Groups allow for recruiters to connect with you with some common bond - instead of just sending you a generic InMail message. When recruiters leverage LinkedIn to find candidates, they use key words (which should be in your profile) to find the right candidates. When you show up in a Group, you two already have something in common (the Group), and you have moved towards the top of the list for getting reviewed and possibly contacted. Simply put, you’re easier to interact with - even more than a third-level connection. Feel free to connect with any recruiter in a Group that looks to be working within your field. They have selected this Group for a reason - they too, want to be found. If they are in a Java Programming Group, generally, it is not because they want to learn more about coding in Java. They want to network with Java experts. A quick glance at a chart of the Internet’s fastest-growing social networks reveals what you likely already knew (Instagram is growing like mad) and what might be a surprise: LinkedIn is the third-fastest-growing social network. We at the Buffer blog can vouch for LinkedIn’s growth as our blog has experienced a swell in LinkedIn referral traffic over the past year, up 4,000 percent from last year at this time. Part of that has to do with our emphasis on updates and sharing at LinkedIn, another part has to do with the popularity of LinkedIn contributing a larger audience and more eyes to our content. Together, these factors have made LinkedIn a great source of visitors for our blog, and I’d imagine you might see a similar impact on your own site. So the question becomes: How best to take advantage of this expanding interest in LinkedIn? Though the network isn’t analyzed in quite the same detail as Facebook and Twitter, there still exist several stats and tidbits that can help you improve your LinkedIn marketing and engage with your followers. Twitter and Facebook may reign when it comes to social sharing of stories, blog posts, and visual media, but when it comes to direct traffic to your main site, LinkedIn is far and away the No. 1 social referral source. Econsultancy reported this gap based on a two-year research study involving 2 million monthly visits to 60 corporate websites. LinkedIn’s referrals, which accounted for nearly two-thirds of all social referrals to corporate homepages, nearly quadrupled the second-place Facebook. If you want to reach the largest number of users with your content, it makes sense to publish when people are around. LinkedIn has found their busiest times to be morning and midday, Monday through Friday. Business hours, in general, have the largest maximum reach, so you don’t have to be too particular about specific times. Test what performs best for you. Be sure your posting schedule matches up with the rhythms of the LinkedIn audience. If you happen to curate your content in the evenings, you can use Buffer to schedule your posts to go live the following day at the time you choose. Just how important are LinkedIn recommendations? No one outside of LinkedIn’s leadership can answer that question definitively, but since this function continues to exist long after other features have gone the way of the dodo bird, I think it’s safe to assume that LinkedIn and its clients (namely recruiters and hiring companies) find them helpful. If there is any chance at all that recommendations can shape a recruiter’s or hiring executive’s opinion of your candidacy, then they are worth pursuing in a strategic way. While we don’t know the search algorithm LinkedIn uses to analyze candidate profiles on behalf of recruiters and hiring executives, we do know that keywords play a key role. Keywords are also critical in shaping the perceptions of recruiters and hiring managers. To see what I’m driving at, try this quick experiment. Select a keyword that you are skilled in – let’s say “B2B sales.” Input that example in the search line at the top of your screen on LinkedIn. Your search will turn up profiles with that keyword highlighted each time it is used. Now, here’s the important thing to notice: LinkedIn also highlights this keyword in the recommendations section of each profile in your search results. 1. Weave industry-specific keywords into each recommendation you receive. Select 1-3 (no more) critical keywords for your industry that you already stress throughout your profile. Identify a specific problem, project, challenge, or initiative you worked on which clearly demonstrates these skills. When you request or are offered a recommendation, request that they focus their comments on the 1-3 keywords you selected above and use the problem, project, or initiative you identified as the focal point for their recommendation. Review the recommendation when it’s received. Request text changes if needed to tighten the keyword and achievement content. Make sure specific results are included if at all possible. Ask the recommender to accept the changes and then add the recommendation to your profile. For recommendations you have already received, review them to see where specific key skills or projects can be added to deepen the content’s relevance to your career goals. Why is this step important? Because LinkedIn counts keywords used in recommendations when they rank order your profile in recruiter and company search results. Using your strongest keywords in recommendations is a hidden way to boost your profile ranking and cultivate more career opportunities. Only accept and give recommendations from people that you actually know or have worked with. Is LinkedIn an active part of your job search? Have you maximized your profile, polishing it until it shines? If not, there’s a good chance you’re behind the curve — by about a decade. According to LinkedIn, 5.7 billion job-oriented searches were done on the platform in 2012. This means that recruiters in your industry are hopping on the social media giant any time they need to locate new talent. So, consider what they’re going to find. One professional has a bare-bones LinkedIn profile that includes his name, title, and a basic summary — more or less a copied-and-pasted resume. Another professional includes the same information, but her tone is conversational and full of powerful keywords. She describes past roles in first person, providing insight into critical duties and how she overcame challenges. Which professional would you pursue? More importantly, which professional are you? Spending time on yet another online profile might seem unnecessary, but you should approach it like every other part of the job search. You get your resume just right. You find the perfect interview outfit. Put the same effort into LinkedIn, and recruiters will flock to you. Use your areas of expertise and specialties to trigger keyword searches. Let’s say a recruiter in your area needs a copywriter. She’ll get on LinkedIn and search for those parameters. The more times you incorporate “copywriter,” “advertising content,” “campaign development,” and other industry words into your profile, the more likely you’ll appear in her search results. Don’t just list words in bullet points, though. Expand on your areas of expertise with compelling prose, and position yourself as a subject-matter expert. Don’t forget about the extras. Categories, groups, articles, and awards are all extra areas that should shine on your profile. They’re typically farther down the page, so recruiters scrolling down to see them are likely interested in you as a candidate. The relative importance of each of these areas varies by industry. For example, in nonprofit industries, participation in LinkedIn and physical community groups is important. But in warehouse management, not so much. Be selective with the categories and groups you choose. Find five to 10 within your industry that garner the most engagement and attention. Besides looking good on your profile, if you become active in these groups and leave insightful comments, you’ll expand your industry knowledge and position yourself as a thought leader. Don’t hesitate to show off your awards, either. Potential employers want to know anything that differentiates you as a candidate. LinkedIn has leveled the playing field for in-house recruiters and smaller staffing firms alike —providing a powerful pipeline tool once reserved for deep-pocketed agencies. With such a massive pool of potential candidates out there, you need to stand out any way you can. And with a little effort on LinkedIn, it’s not too difficult. We’ve had more than 2,000 downloads since we’ve launched our new search engine just 48 hours ago! Now it’s time to see exactly how you can use this awesome tool to uncover some of the best hidden profiles on LinkedIn! You may run a profitable, fast-growing startup, but without an active network of trusted and influential connections, your business probably isn't living up to its full potential in terms of sales, profits, and growth. Referrals and connections are the currency of the business world, and taking the time to build and nurture your network really pays off in the form of new leads, personal opportunities, and good old-fashioned social capital. Even if you have 500+ connections on LinkedIn and a Klout score that's through the roof, there's really no way to know how strong your network is without actually testing it. Who's in your circle? Ideally, you should aim to build a diverse network of professionals across a variety of industries (rather than scores of colleagues from your core industry or the same firm). Check out how well-rounded your network is, and if it seems too one-sided, it might be time to reach out to new colleagues in other industries. How often are you interacting with others? The frequency of interactions with your network can give you an idea of how well it's functioning. If you never seem to receive any queries, recommendations, or invitations, try squeezing in another social event this month, or spend an extra hour making new connections and offering endorsements on LinkedIn. Are you able to call on your network? A healthy, active network will be there for you whenever you need it--not just in times of trouble. Try reaching out, and if nobody responds, you might need to dedicate more time to cultivating those relationships more actively (and with reciprocity) at conferences and industry events. With up to 94% of recruiters looking at you on LinkedIn, young careerists must continuously maintain a high-quality profile on the world’s largest professional network. Just as important: attracting the attention of recruiters and employers as they look to fill great positions you just may be interested in! 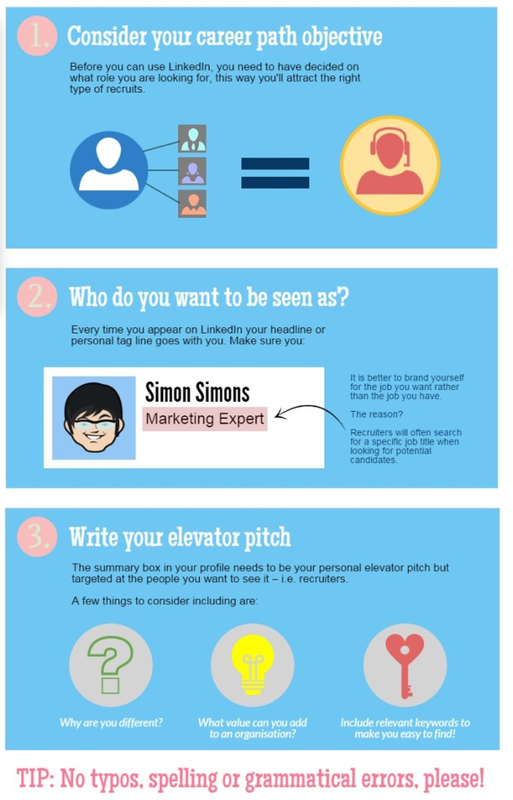 This infographic by Armstrong Appointments, with a 10-step guide to optimizing your LinkedIn profile specifically for recruiters, helps us do just that. After all, you want to recruiters to find you even when you aren’t actively looking for your next gig… right? Take a look… and then see if maybe your LinkedIn profile couldn’t use a tune-up as we start 2015! Use LinkedIn as your professional social media resource and connect with the top professionals in your industry. Often, you can find these new connections by searching your contacts and looking for similar acquaintances. Reaching out with a question can help start a conversation about your field and be beneficial to both you and the potential new contact. Set a goal for yourself for a specific number of conversations per month with new contacts. Six words that scare off potential clients or hiring managers: “I see you viewed my profile…” Just because someone is looking at your profile does not mean that they found anything useful. The purpose of your profile is to show people what you have to offer. Either they are just browsing or they didn’t see anything they liked on your profile, but either way, those six words aren’t making things better. Try to make a monthly goal with your LinkedIn by connecting to more colleagues or business associates. By continuing to grow your social network, you are preventing your online presence from becoming stale. If you are reading this, chances are you have a profile on LinkedIn, the popular networking site for professionals. It doesn’t matter if you like or hate the network (plenty of supporters on either side of the fence) anyone who wants to tap into its network of more than 300 million members will want in on that piece of pie. To help you with that, we have here a list of apps – found within and outside LinkedIn – that can help you do more with your LinkedIn profile, and help you improve your value as a professional worker, in general. From knowledge builders, to connection-making apps, powerful search engines and free templates to help you better approach a potential client, here are 10 applications to help you supercharge your personal value in LinkedIn. Don’t let INstant Search’s simple appearance fool you. Login then type any keywords related to your field into the search box, and the app will instantly pull out the profiles of LinkedIn users whom you probably know in real life – even if they’re not officially in your LinkedIn network. SlinkyApp takes the stress out of crafting tailored introductions for every new LinkedIn contact, and you know how important it is to make a good first impression. SlinkyApp helps you create and edit templates for Introductions, Messages and InMails. The app, which is available as a Chrome extension, will pop up and ready itself for use, everytime you visit a relevant page on LinkedIn. When it comes to LinkedIn, quality connections matter. LinkedIn’s Connected helps you develop these connections by notifying you of contacts’ birthdays, anniversaries, and other important life events. Professional networking website LinkedIn has revealed 25 hottest skills that were in demand in the US this year. LinkedIn analysed the skills and experience data in over 330 million member profiles to gather the data. The LinkedIn report shows that tech skills dominated the 'hottest skills' list. "Across the globe, statistics and data analysis skills were highly valued. In the US, India, and France, cloud and distributed computing skills were in particularly high demand," Sohan Murthy, research consultant at LinkedIn, wrote in a blog post. Mr Murthy also said that digital, online, and SEO (search engine optimization) marketing skills were also in demand. Fueled by hiring gains, cheaper gas and rising confidence, consumers and businesses drove the US economic growth to a sizzling 5 per cent annual rate in the September quarter of this year. This was the fastest since and was followed by a 4.6 per cent annual rate of growth in the April-June quarter. Employers in US added 321,000 jobs in November, the most in nearly three years. The unemployment rate held steady at 5.8 per cent, down sharply from 7 per cent 12 months earlier. In the first 11 months of this year, US employers have added 2.65 million jobs. That already makes 2014 the best year for hiring since 1999. Let me preface this piece by stating that developing a LinkedIn strategy might not involve the same star power as, say, Barbara Walters’ The 10 Most Fascinating People of 2014. Chances are that you’re not going to aim to meet Amal Clooney via LinkedIn. 1. Guest bookers, media producers and editors. In my time using LinkedIn, I have booked a number of interviews for myself and some guest pieces requested, without my consciously making an attempt to connect to media professionals. They found me. And I, as a publicist, was able to share some of the love with my clients. Even if you’re not working in public relations, know that there are media contacts out there who are looking for sources. Some of the friendliest editors and producers I have connected with found me via LinkedIn. If you make a concerted effort to contribute to LinkedIn Groups and have the good fortune that these media professionals find you, you can end up with press you haven't been directly seeking. The media folks that find you could be guest bookers for a podcast syndicated in five major markets or the editor of a respectable publication that's not yet a household name. The resulting media coverage will be something you’re proud to share via your website, social media and newsletter and can leverage to attract bigger opportunities. The clients you can meet through LinkedIn are usually easier to sell to because they are already familiar with you, what you do and your message, thanks to the guest pieces and blog posts you share in your LinkedIn Groups. People become fans and start tracking your profile. Or they stumble across you, a member of one of their LinkedIn Groups, read your bio and realize you’re just what they have been missing.